In 10-inch skillet, cook beef over medium-high heat 5 to 7 minutes, stirring frequently, until thoroughly cooked; drain. Reduce heat to medium. Add corn and tomatoes to beef in skillet; cook until thoroughly heated and desired consistency, stirring occasionally. In small microwavable bowl, microwave cheese cubes and 2 teaspoons water uncovered on High 15 seconds; stir and repeat until cheese is melted and smooth. Divide tortilla chips evenly among 6 plates. 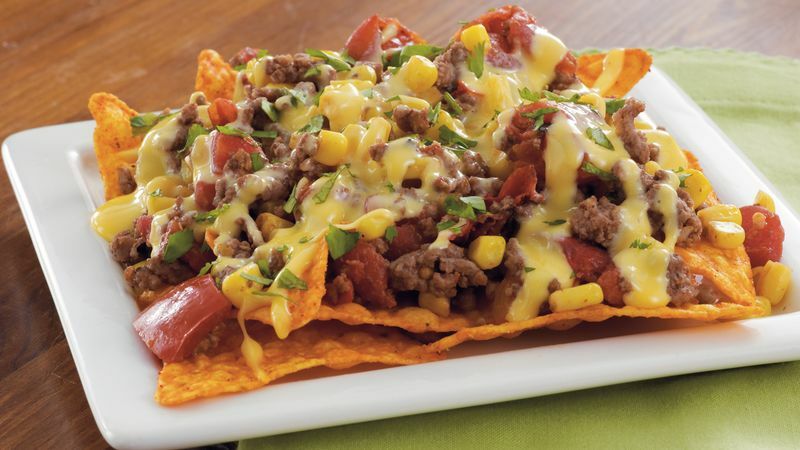 Top with beef mixture; drizzle with melted cheese. Garnish with chopped fresh cilantro, if desired. You can substitute ground chicken or turkey for the ground beef in this recipe. Vary the flavor of this quick skillet meal by using different flavor chips.